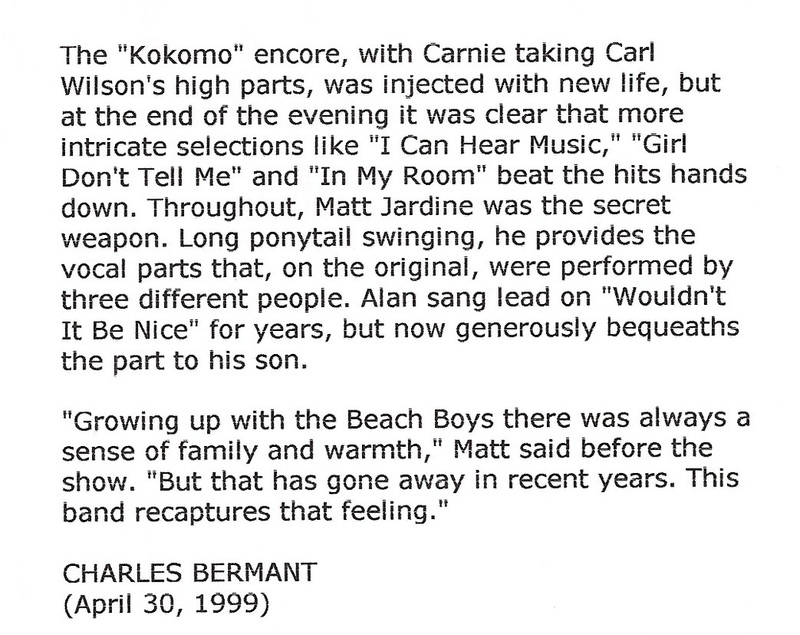 "Throughout, Matt Jardine was the secret weapon. 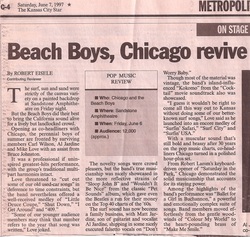 Long ponytail swinging, he provides the vocal parts that, on the original, were performed by three different people." 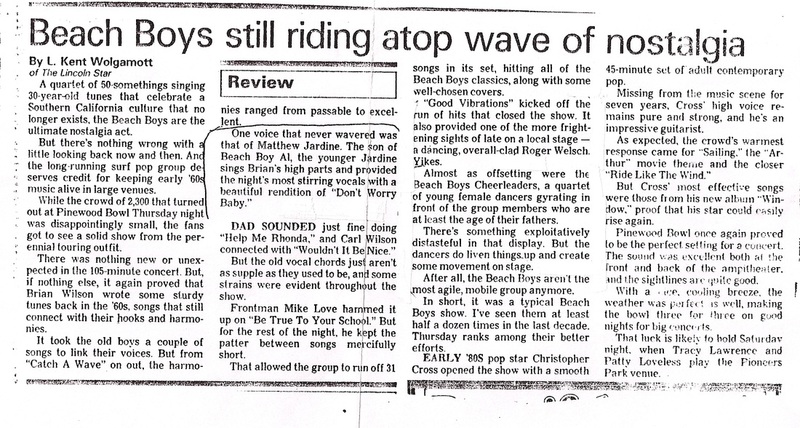 "The surf sound has now become a family business, with Matt Jardine, son of guitarist and vocalist Al Jardine, shipping in some nicely executed falsetto vocals on "Don't Worry Baby". "To ensure good vibrations into the next millenium, a second generation has joined the act. Al Jardine's son Matt took many of Brian Wilson's falsetto parts at Thursday's Lewis and Clark Park concert and did a better than respectable job. 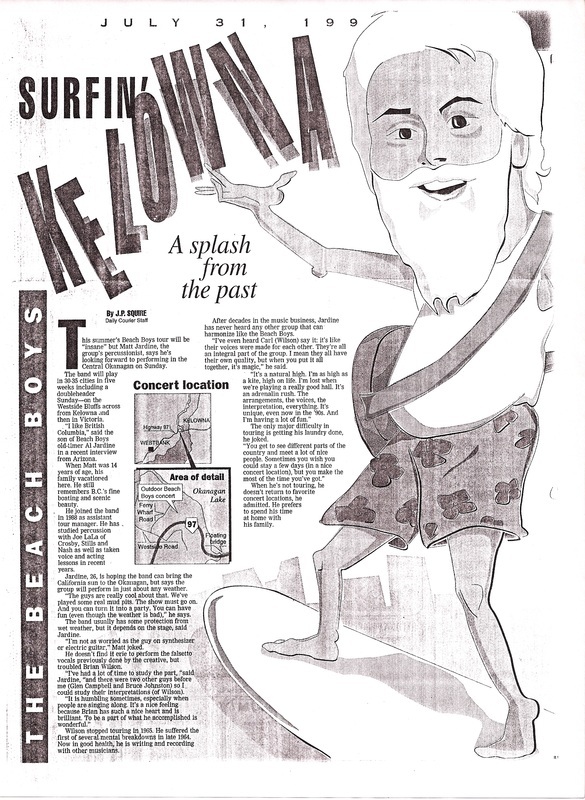 Jardine Jr., in fact, has a better feel for many of the old songs..."
"...Jardine gives some of the surf tunes real life. He's a welcome addition-the group's, great blonde hope-who should be given more to do." 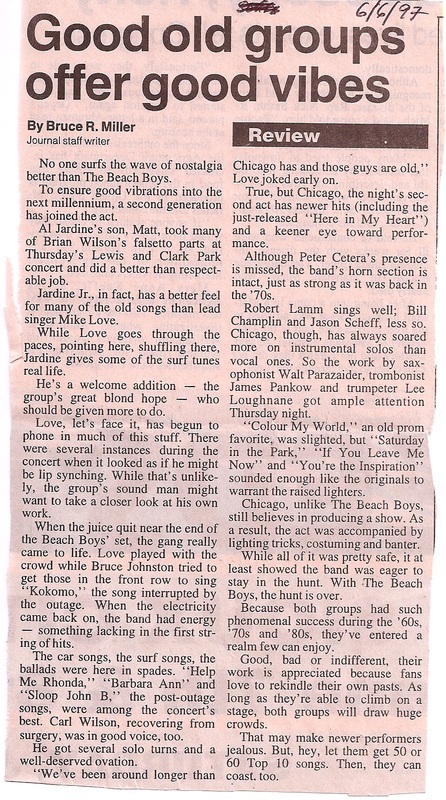 This is an interview Matt did while on tour with the Beach Boys. 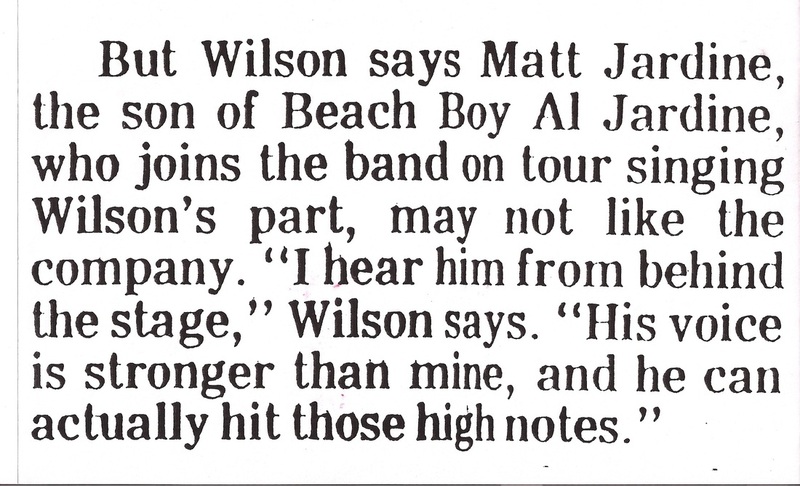 A quote from Brian Wilson on Matt's vocal talent. "I hear him from behind the stage," Wilson says. 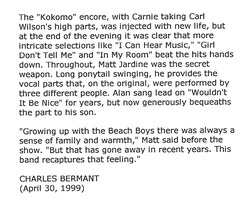 "His voice is stronger than mine"
"...Matthew who onstage hides behind the conga drums, hitting all the high important notes that enable the Beach Boys to sound like, well, the Beach Boys." "Love, Al Jardine and Wilson can still sing but Matthew Jardine is like Cyrano, the one feeding the poetry to the music." 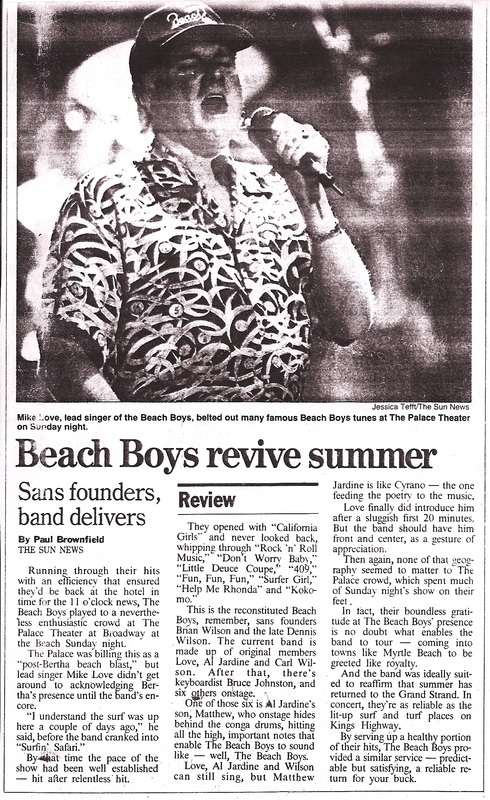 "...the band should have him front and center as a gesture of appreciation." Jardine sings Brian's high parts and provided the nights most stirring vocals with a beautiful rendition of Don't Worry Baby.."
"And while he (Al Jardine) began "Sloop John B", it was taken over by his son Matthew Jardine. 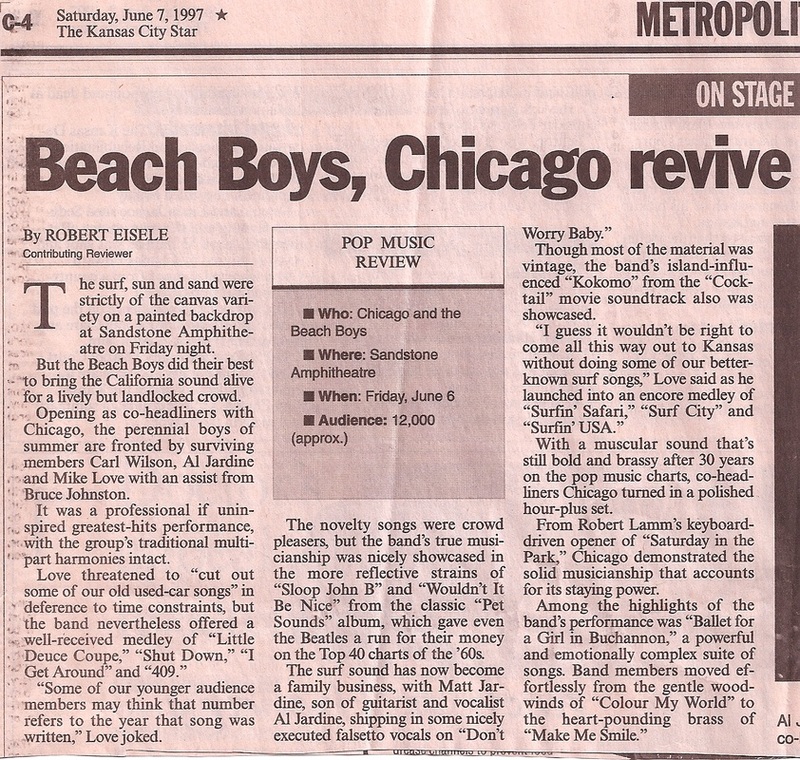 By the end he was the standout singer, being the only one who could the kind of falsetto Brian and Carl had done."